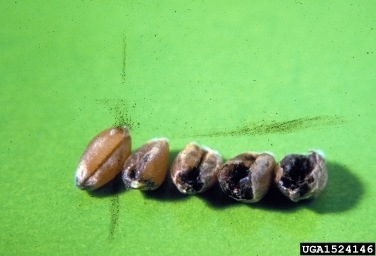 Karnal Bunt (Tilletia (Neovossia) indica) is a pathogen of stored grains. It has been found in the southern US, and its presence affects export status of those commodities. To date, it has not been found in Wyoming. The Wyoming Karnal Bunt Survey is conducted through a joint effort between USDA APHIS PPQ and the Wyoming Department of Agriculture. USDA survey protocol requires 1 sample for every 1,000,000 bushels of host produced in a county. A sample of grain is collected from the grain storage facility or transport truck and sent to a USDA approved lab in Texas for testing. The Karnal Bunt Survey has been conducted in Wyoming since 1995.